The most distal part of a developing limb. It consists of the rudiments of the carpal and tarsal bones, metacarpals and metatarsals, and the phalanges, and will eventually become a hand or a foot. The process whereby an organization produces itself. An autopoietic organization is an autonomous and self-maintaining unity which contains component-producing processes; an example of autopoiesis in nature is a cell or an organism. A place-to-place journey over rough country in motor vehicles. A reference to organisms adapted to stream environment and which complete their life cycles in streams or rivers. The ability of the body to defend its tissues by producing autoantitoxins. 1. 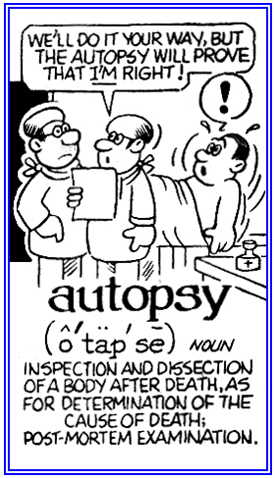 An exhaustive critical personal examination or inspection of something: Mrs. Jones students were asked to do an autopsy, or a discerning analysis, of the book they had to read for their English class. 2. The examination, after death, of an animal body, usually human, with the intent of determining the cause of death, the extent of a disease or injuries, the effect of therapy, and the existence of any previously unrecognized antemortem pathological condition: After Mary’s young cat, Mini, died, she wanted to know whether it had been poisoned and so an autopsy was performed by the veterinarian. © ALL rights are reserved. Of or pertaining to self-consciousness or the awareness of oneself. An abnormal rhythmic activity of the brain, once thought to be associated with insanity. Self-analysis; the exploration of one's own thoughts and feelings as a way to gain insight into the origins and significance of one's behavior or symptoms. 1. Image of the distribution and concentration of radioactivity in a tissue or other substance made by placing a photographic emulsion on the surface of, or in close proximity to, the substance. 2. An image recorded on a photographic film or plate produced by the radiation emitted from a specimen; such as, a section of tissue, which has been treated or injected with a radioactively labeled isotope or that has absorbed or ingested; such an, isotope. Showing page 18 out of 24 pages of 354 main-word entries or main-word-entry groups.